​​​​​​​​ ​LA PORTE – Georgia-based Beazer Homes and Arizona-based Taylor Morrison have begun site work on a 200-acre master-planned community off Bay Area Blvd. between Fairmont Pkwy. and Spencer Hwy. Morgan’s Landing is expected to deliver the first 600 homes by spring 2018. Site plans found from a La Porte City Council meeting in December 2017 showed a 7.5-acre tract marked for senior living and a 19-acre tract designated for multifamily. 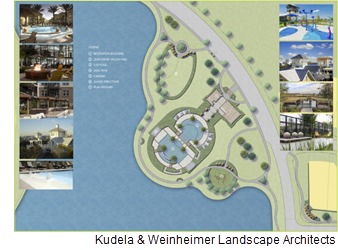 Amenities will include a recreation center, community pool, lap pool, zero-entry splash pad, dog park, and poolside cabanas. ​See also: La Porte: 369 acres sold for commercial, residential​.